The Model DX-12 1-Channel Amplified Receiver is designed for use in security systems and remote switching functions. The receiver is housed in a heavy-duty metal case to ensure reliable operation without detuning when installed inside another metal housing. It incorporates an RF pre-amplifier and can be used with the EXA-1000 or EXA-2000 remote antennas for improved range. Typical applications for the receiver include adding a wireless zone, a panic button, or creating a remote arm/disarm feature for a hardwired alarm panel. 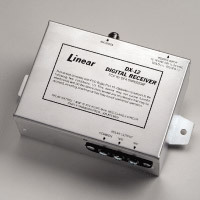 Each time a transmitter is triggered with a digital code matching the receiver’s digital code, the receiver’s relay will activate for four seconds. The Model DX-12 is compatible with standard digital transmitters only. The output of the DX-12 receiver is isolated dry relay contacts. Dry contacts indicate that the switching contacts are isolated from the receiver’s power supply. The receiver provides normally open and normally closed contacts. The current rating of the relay output is 1 amp at 32 volts maximum.